We regard our social activities as a very important aspect to our club life and in many ways the glue that bonds the membership together. Various activities are organised throughout the year which give members, their partners and their friends, opportunities to relax and enjoy each others company in a convivial atmosphere. At the centre of this program is our Annual Charter and Handover Dinner which takes place at the end of June each year. This event is the celebration of the Darlington Lions Clubs birthday as well as the moment when the outgoing President hands over the chain of office to the incoming President. Partners and friends are always welcome at our social events recognising the fact that without them Darlington Lions Club would be unable to function. In October 2014 Darlington Lion Fred Thompson was presented with a special plaque to recognise his 40 years service as a member of the club. The attached photograph shows Lion Fred Thompson ( centre - 40 years service) with Dave Nicholson (41 years service) & Tom Peacock (45 years service) who had received plaques in previous years. Darlington Lions Club celebrated a most important and successful charter handover at the Croft Hotel on Saturday 5thJuly when Club president Robert Hillary handed over the chain of office to the club's first lady president Pat De Martino. Guests included Lions past district governor Alan Ashburner, Jane Badshaw , Director of St. Teresa's Hospice Darlington , Rotary Club president Ken Wiper and members of Teesdale Lions Club, Teesside Lions Club and Northallerton Lioness Club. Mr Hillary thanked all of the Darlington Lions for their wonderful support in his very busy year in office and summarised with some of the main club events which included donating £2000.00 to Darlington Parkinson's Group for the purchase of special equipment, a further £6500.00 has been donated to St. Teresa's Hospice Darlington and the proceeds of this years craft fayre will also be donated to the hospice.145 food parcels were donated to the Darlington food bank and Salvation Army and Family Help. The club has had a charity bookshop in Darlington for the past forty years and this year celebrated the twentieth anniversary in the same premises in Blackwellgate & Houndgate Mews. Art books have donated to the QE College Darlington and encyclopaedias to St. Aidan's Academy. Darlington Lions Club was one of the original sponsors of the South park run which attracts 200 runners in the park every Saturday morning and the club presented a trophy for their volunteer of the year. He thanked the Darlington Lions Club for their very hard work and commitment and he had been most pleased to accept the Club of the year trophy as the best club in the North of England and Scotland when he had attended the annual convention at Malton N. Yorks. The club has also received the certificate of Club Excellence award. His final tasks before standing down as the club president were to present a cheque for £2500.00 to Jane Bradshaw for St. Teresa's Hospice. The first photo shows our incoming new President Robert Hillary ( left ) with the chain of office and the outgoing President Tony Gent. The second photo shows Tony presenting a cheque for £2000 to Amanda Tweedy the Development and Fundraising officer for Heel & Toe. Over 80 Lions, partners and guests including Lions District Governor, John Sutherland and his wife attended. Tony Gent talked about the work of Darlington Lions and thanked all members of Darlington Lions Club, officers and committee chairpersons for their support in his year of office and John Sutherland responded on behalf of Lions International. Tony Gent wished incoming President Robert Hillary a successful year in office and Robert's two main nominated charities in his year of office will be St Teresa's Hospice and Parkinson's UK Darlington branch. 50th Charter & Handover Dinner 2012. Darlington Lions Club celebrated their 50th anniversary on Saturday, 30th June at the Blackwell Grange Hotel with a successful Charter Dinner Dance and Handover. The photo shows Tony Gent ( right ) the new incoming President of Darlington Lions Club wearing the chain of office after the handover from Richard Western the outgoing President. Over 100 Lions, partners and friends attended with special guest Dulcie Lewis, local author, highlighting the humorous side of Yorkshire life. Outgoing President, Richard Western, said that the club had played an important role in the community over the last 50 years, raising money for local charities and also supporting those individuals in our society less fortunate than ourselves. Richard wished incoming President Tony Gent best wishes in his year in office. The event was held in Hurworth and consisted of 4 teams ( Teesdale, Yarm Middlesbrough & Darlington ) participating in a variety of indoor games. These included putting, hoop- la, darts, pinball and a quiz. Some 40 Lions, and partners attended and the evening was rounded of with the traditional North east delicacy of a " Pie & Peas Supper "
Winners on the night were Teesdale Lions who, were presented with the trophy by John Mutum - Zone chairman. Next year Yarm Lions Club will host the event. Group of happy participants - having been fed !!! Darlington Lions Club celebrated its 50th anniversary on Sunday 19th June 2011 at the Blackwell Grange Hotel with lovely tea party. Special guest and speaker was Mike Amos from the Northern Echo who wrote a splendid article entitled 'Roar Meet' in last Thursdays column.Other guests included Larry Collins.Lions District Governor,Lions Zone Chairman, Fiona Doyle, and Deputy Major of Darlington, Paul Baldwin. There was a pennant from the International Lions President and many former members were present including Les Fielding the oldest at 96 years. Stephen Cowton former President of Zimbabwe Lions and his wife Mary were also present as they were on holiday in Shildon, where Stephen was brought up before he emigrated in 1962. Photo - left to right front row, Larry Collins, Lions Dist Governor,John Biagioni, former Lion, Fiona Doyle, Lion Zone Chair, Richard Western Darlington Lion President , Pat DeMartino, Sandy Duncan and, Jean Pinnegar all Darlington Lions. 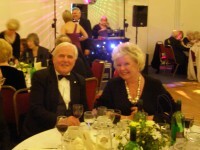 On 6th March 2010 the Lions Club held their annual Charter Night Dinner Dance at the Croft Hotel, near Darlington. 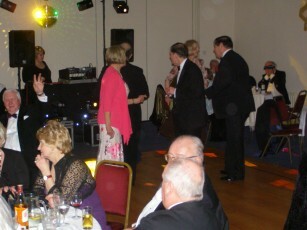 This was to celebrate the club's 48th birthday and was well attended by 80 revellers. An excellent meal was followed by a few short speeches then dancing to disco music provided by a local DJ. Lion President - John de Martino. Brian Bouttell - Finance Director of Yorkshire Cricket Club. 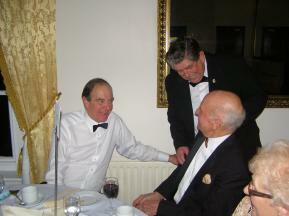 July of every year sees the installation of new office bearers in the club. The photograph shows the 2008 - 09 president Denis Pinnegar handing over the presidential chain of office to John de Martino. This ceremony was held at Blackwell Grange Golf Club and it was also an opportunity to present long service awards to 15 of our members. Outgoing President Denis Pinnegar presented badge chevrons to club members with service totalling over 400 years. Lion President Denis remarked this was an amazing number of year's service to the club and thanked all members for their dedication and hard work over this historic number of years. The recipients of the award are in the group photograph below. 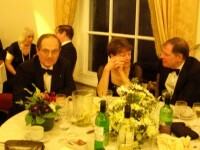 We regard our social activities as a very important aspect to our club life and in many ways the glue that bonds the membership together.Various activities are organised throughout the year which give members, their partners and their friends, opportunities to relax and enjoy each others company in a convivial atmosphere. At the centre of this program is our Annual Charter and Handover Dinner which takes place at the end of June each year. This event is the celebration of the Darlington Lions Clubs birthday as well as the moment when the outgoing President hands over the chain of office to the incoming President. Other social events can include: Theatre visit Coffee and cake mornings Strawberry and Wine evening Burns Night Supper Pub Quiz and Supper River Cruise and Lunch Christmas Party BBQ etc Partners and friends are always welcome at our social events recognising the fact that without them Darlington Lions Club would be unable to function.